Las Vegas Motor Speedway has secured a coveted second Monster Energy NASCAR Cup Series race weekend for the 2018 season and beyond via an intramural “realignment” affecting two other facilities in the Speedway Motorsports, Inc., empire. SMI President/CEO Marcus Smith made the announcement during a news conference with Las Vegas Convention and Visitors Authority officials at Cashman Center on Wednesday, two days before the green flag will fall on LVMS’ single 2017 NASCAR weekend. The 1.5-mile LVMS oval will host its second Cup race beginning in the fall of 2018 in addition to its annual March NASCAR weekend, with the Cup date coming from sister SMI facility New Hampshire Motor Speedway’s September schedule slot. The unsponsored New England 300 on Sept. 24, 2017 will be NHMS’ final fall Cup race. There was no mention of the realignment on NHMS’ official website. NHMS apparently will retain its mid-July Cup/Xfinity weekend dates in 2018. LVMS also will welcome a second NASCAR Xfinity Series race beginning in the fall of 2018 _ from sister facility Kentucky Speedway _ and an additional NASCAR Camping World Truck Series race from NHMS beginning in the spring of 2018. The Vegas realignment deal reportedly is for seven years at $2.5-million annually. With the realignment both of LVMS’ NASCAR weekends will feature races from NASCAR’s top three national touring series _ the first facility on the NASCAR schedule to do so. Official race dates will be announced later this year by NASCAR as part of the release of full 2018 schedules. LVMS first hosted a NASCAR Camping World Truck Series race in 1996, added a NASCAR Xfinity Series race in 1997 and will host its 20th Monster Energy NASCAR Cup Series event, the Kobalt 400, on Sunday. The first race held at the facility north of the famed Vegas Strip was the Indy Racing League’s Las Vegas 500K in 1996. New Hampshire Motor Speedway’s 1.058-mile oval has hosted two Cup events annually since 1997. “The Magic Mile” _ largest sports and entertainment facility in New England _hosted its first Cup series event in 1993 under ownership of track founder Bob Bahre. O. Bruton Smith, SMI’s executive chairman and Marcus Smith’s father, purchased the facility from Bahre in November 2007 following years of contentious negotiations. Kentucky Speedway General Manager Mark Simendinger put a positive spin on the realignment shuffle. “We accomplished great things with the NASCAR Xfinity Series race in September, and now it will continue to grow during this exciting new weekend,” Simendinger said in a statement from Sparta, Ky. The realignment will affect the Xfinity Series VisitMyrtleBeach.com 300 night race booked for Sept. 23. “We were the last Monster Energy NASCAR Cup Series track to hold an Xfinity Series race on a non-Cup weekend,” Simendinger said. “It makes sense to combine all three NASCAR national touring series as this big weekend in Las Vegas is launched. I fully expect Las Vegas to be THE place for NASCAR fans to be in the fall, just as it is in the spring. Kentucky Speedway opened in 2000 but did not host its first Cup race until 2011. The 1.5-mile track’s 2017 NASCAR schedule features Camping World Truck Series, Xfinity Series and Cup night races from July 6-8. Wednesday’s announcement confirmed a rumor that picked up steam last weekend during NASCAR’s annual spring visit to Atlanta Motor Speedway, another 1.5-mile SMI facility located in Hampton, Ga.
Steve O’Donnell, NASCAR executive vice president and chief racing development officer, echoed Powell’s remarks. “Las Vegas and Las Vegas Motor Speedway have become great destinations for NASCAR fans,” O’Donnell said. “The experience is unique to any other in our sport. We look forward to having NASCAR racing there for two race weekends in 2018.” Las Vegas also is home to NASCAR’s season-ending and week-long awards ceremonies and banquet. The addition of a second NASCAR weekend in Las Vegas looms as a significant economic boost for the region, with the news welcomed by the Las Vegas Convention and Visitors Authority Board of Directors. Rossi Ralenkotter, president/CEO of the Las Vegas Convention and Visitors Authority, noted the city has become a major sports destination for a variety of championship and professional events. SMI also plays host to double NASCAR race weekends on the half-mile Bristol (Tenn.) Motor Speedway and 1.5-mile Texas Motor Speedway in Fort Worth, as well as a single event on the road-course at Sonoma (Calif.) Raceway. LVMS’ 2017 NASCAR weekend will begin with the Stratosphere Pole Day on Friday, with Cup qualifying beginning at 4:45 p.m., (Pacific Time). The Xfinity Series’ Boyd Gaming 300 is scheduled for 1 p.m. on Saturday. 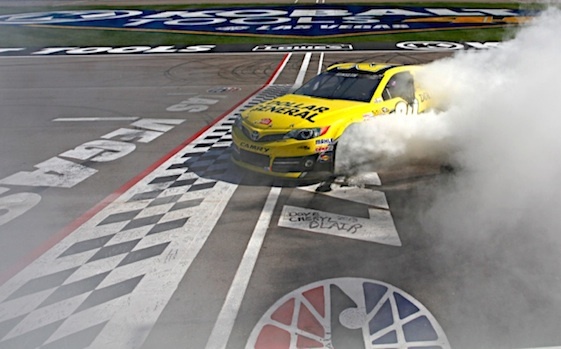 The weekend will culminate Sunday with the Kobalt 400 at 12:30 p.m.